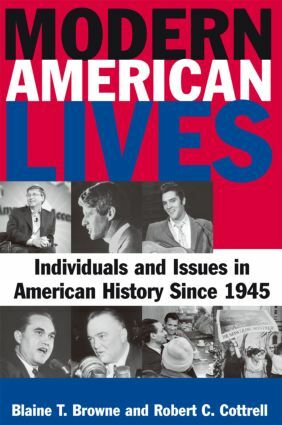 The individuals presented in these narrative biographies significantly, and sometimes decisively, impacted contemporary American life in a wide range of areas, including national politics, foreign policy, social and political activism, popular and literary culture, sports, and business. The combined biographical/thematic approach is designed to serve two purposes: to present more substantive biographical information, and to offer a fuller examination of key events and issues. The book is an ideal supplement for undergraduate courses on The United States Since 1945, as well as for courses on Modern America and 20th Century America. Preface; Introduction; Part I. Years of Consensus, 1945-1960; 1. Defining the Cold War; George F. Kennan: The Origins of Containment; Henry A. Wallace: The Case for Cooperation; 2. Fighting the Cold War at Home; I.F. Stone: Dissent in an Age of Conformity; J. Edgar Hoover: Combating the Red Menace; 3. The Transformation of Popular Culture; Marilyn Monroe: The New Sexuality; Elvis Presley: The Birth of Rock and Roll; 4. Outsiders in a Conformist Society; Jackie Robinson: The National Pastime and the Issue of Race; Allen Ginsberg: Avatar of the Beats; 5. Defending Democracy in the Nuclear Age; Curtis LeMay: Planning for Armageddon; C. Wright Mills: Prophet of the New Left; Part II. From Confidence to Crisis, 1960-1980; 6. Civil Rights and Social Justice; Fannie Lou Hamer: The Mississippi Freedom Democratic Party; Cesar Chavez: The United Farm Workers Union; 7. Challenges to the Liberal Consensus; Tom Hayden: The Birth of the New Left; Barry Goldwater: The Roots of the New Right; 8. 1968: The Hope and the Fear; Robert Kennedy: The Promise of the New Politics; George Wallace: The Politics of Rage; 9. Implosions: The Collapse of the Counterculture and the New Left; Jimi Hendrix: The Limits of Cultural Radicalism; Bernardine Dohrn: The Death of the New Left; 10. The Women's Movement: Revolution and Reaction; Gloria Steinem: New Directions for Feminism; Phyllis Schlafly: Counterrevolution on the Right; Part III. The Search for New Directions, 1980-Present; 11. The Roaring Eighties: Patriotism, Piety, and Profit; Jerry Falwell: The Emergence of the Christian Right; Bill Gates: The Profitability of Techno-Times; 12. After the Revolution: New Horizons for Black Americans; Tiger Woods: Golf's Great Black Hope; Clarence Thomas: Black Conservatism in Judicial Robes; 13. America and the New World Order; Paul Wolfowitz: Democratic Imperialist; Noam Chomsky: Radical Gadfly; About the Authors.